You may well ask: “Why direct action? Why sit-ins, marches and so forth? Isn’t negotiation a better path?” You are quite right in calling for negotiation. Indeed, this is the very purpose of direct action. Nonviolent direct action seeks to create such a crisis and foster such a tension that a community which has constantly refused to negotiate is forced to confront the issue. It seeks so to dramatize the issue that it can no longer be ignored. Immigrant rights leader, Ju Hong, has been the subject of much derision in mainstream media circles for interrupting the President during his last speech on immigration reform. However, he is a hero among the undocumented. I am proud to call Ju Hong, a graduate student at my alma mater, San Francisco State University (SFSU), a comrade in the struggle. 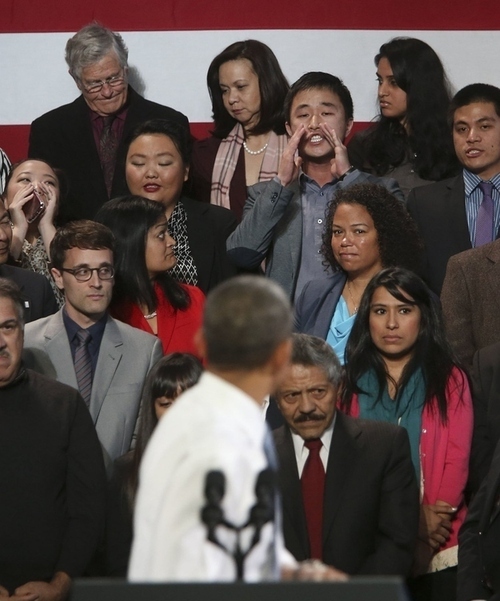 Mr. Obama then cut him off and began a misleading ad-lib about how halting deportations would be illegal. While the president cannot throw out whole sections of immigration law to bypass Congressional inaction, he does have discretion in choosing how to enforce it wisely. Mr. Obama was firmly within the law when he selectively halted deportations for some immigrants brought here illegally as children and for spouses and children of service members and veterans. He can undoubtedly expand administrative efforts to protect other immigrants left stranded by legislative failure. Earlier today on Al-Jazeera International, Neidi Dominguez, a leader from the California Immigrant Youth Justice Alliance, and I held down the fort for Ju Hong, and many others in the community who have put their lives on the line and engaged in civil disobedience actions over the past few years. Hong’s call to the President to stop deportations resonated with many in the immigrant rights community who have made the same demand through sit-ins, stopping deportation buses, locking themselves to the gates of detention facilities and so on. These actions serve to not just place a spotlight on our communities that are devastated by deportations. These actions also empower us to let go of the fear of our unauthorized presence in this country, and become unafraid and unapologetic. As Neidi stated on Al-Jazeera, getting arrested could have meant deportation for her last year, but she would face it on her own terms. When the Obama Administration executed a notice to start my deportation, it was on my own terms. Alas, I still yearn for a home and family I have not seen in almost 15 years. Civil disobedience actions are the theatre of the oppressed–a performance to make a larger political point. Across the country, members of our community are openly and directly challenging policies that are tearing our families apart, at detention centers, out on the streets and even at the border. We are tired of seeing parents separated from their children, and we are simply not willing to take it anymore. Whether or not we get any type of immigration reform from Congress, it is very clear that we have created a fundamental paradigm shift and fostered a major cultural transformation of our people into “undocumented and unafraid.” We are here, many of us are queer, and we are not going away. Criticizing people such as Ju and Neidi for escalating serves as a tactic to further oppress our communities, and perpetuates violence against already vulnerable migrant bodies. Those with more privilege than us tend to forget that the “undocumented and unafraid” come from some of the most vulnerable communities, and we carry many traumas. It takes not just boundless energy, but persistent courage, to live and breathe in this country on a daily basis. Taking part in the theatre of the oppressed is the only way the politically deaf will not only hear, but listen to our voices. The calls have reached a fever pitch, transformed into a chorus, and will only grow louder with each passing day. What Hong did is a good disruptive tactic to incite social change–not necessarily policy change. Laws are passed and repealed in this country through congress, the House of Representatives and Senate. It’s not within the President’s power to revoke or install laws to his own liking. It’s not a monarchy, and even in monarchies such power may be limited with parliament. Targeting House of Representatives and Senators would be a more conducive move. I rep Hong for his bravery, but what he did was not necessarily the most productive for changing legislation. He sparked controversy and generated media attention, but that’s about it . . .